We love playing new slots here at Online-Slot.co.uk and both Playson and betdigital have released their upcoming titles exclusively early. Powered by Playson, Wild Warriors is due for release on the 22nd of November (2018) – with 5 reels and 30 paylines, you join fearsome lady warriors in this fantasy themed adventure from as little as 30p a spin across all devices. With panthers and the quarter of female warriors on the reels, look out for the wild which is fully stacked. Wild Warriors comes with a Free Spins feature where you can play with up to 25 free spins. All 4 lady warriors as Colossal Symbols spinning in 2×2 or 3×3 size. Medium to high variance, you can win 673 times your stake on every single spin – check out the Wild Warriors slot review for full details. 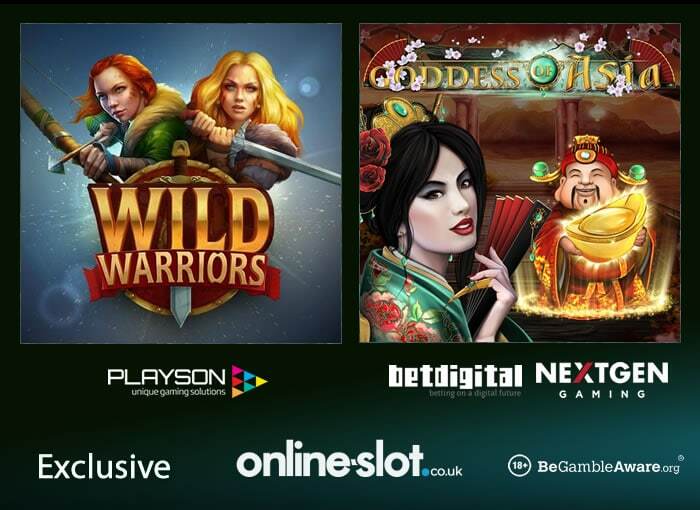 You can play Wild Warriors exclusively at NetBet Casino – sign up using code EXCLUSIVE1 to get a 100% match bonus up to £200 plus an exclusive 200 free spins which can used on any NetEnt slot. Then make a 2nd and 3rd deposit using codes EXCLUSIVE2 and EXCLUSIVE3 respectively to get 75 and 100 more NetEnt free spins – that’s an exclusive 200 NetEnt free spins in total! Powered by betdigital and NextGen Gaming, Goddess of Asia is a 5 reel, 30 payline slot that can be played on all devices from 30p a spin. With a traditional Asian theme, this beautiful-looking game comes with a wild that doubles your payout when part of a win. There’s also a fan symbol that applies multipliers to your winnings or free respins with a wild reel. Goddess of Asia also comes with a Free Spin Bonus feature where you can win up to 15 free spins – the fan acts as an accumulator which gives you an overall multiplier for your total winnings. With potential payouts of 6,000 times your stake on each free spin, make sure you read the Goddess of Asia slot review. Goddess of Asia is available exclusively at Mr Green Casino – sign up to get an exclusive 20 no deposit bonus spins on NetEnt’s Starburst. Then make your 1st deposit to get a 100% bonus up to £100, 100 Starburst bonus spins and 100 more bonus spins on various NetEnt titles.